Tomorrow the CRF team leaves for Kenya. I have enjoyed sharing 40 stories with you and I’m sure I’ll have more to share when I return. Please pray for our safety in the air and for our ministry on the ground. For my final story I simply want to share a passage in the Bible. When I first traveled to Kenya in 2009, Psalm 91 seemed to appear everywhere. It was spoken aloud on the radio as I drove to the airport, it was the page I saw when I let my Bible fall open, and it appeared in notes and sermons and seemingly everywhere I looked. And so as I return to the country I now consider with as much love as I would a second home, here is this precious chapter of the Bible that seems to fit a long journey so well. Julius’s earliest memory was when he was five years old. He was already living on the streets at that point and he has no memory of any relatives or parents. Julius does not know his tribe, a remarkable thing in Kenya. He has no “mother tongue.” He speaks only English and Kiswahili. Julius grew up completely and utterly alone. To survive, Julius spent his days either begging for money with other street boys or selling scrap metals on the roadside. Due to the terrible conditions on the streets, Julius contracted a disease that caused his entire body to shake. For 4 years, Julius lived with a kindly neighbor, but her house burned down and he was back on the streets again. Julius began to spend the night at a video store that closed at one in the morning. His health decreased as he struggled daily to survive. 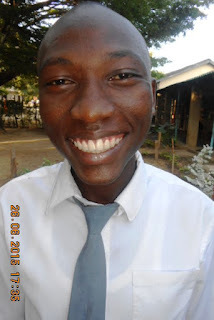 Three years ago, Julius entered the Christian Relief Fund sponsorship program, went to live at the Kimbilio Christian Academy, and got a sponsor. For the first time he had security in where he lived. He had a real chance to go to school to stay. And he had a sponsor who would become the closest thing to family to him. God sets the lonely in families. There is no truer definition of lonely than what Julius has faced in his life. But he is in a family now—his church family, his school family, his CRF family, his sponsor. In a few days, Julius will meet his sponsor for the first time. They will go on a safari together. They will embrace and talk, face-to-face. God sets the lonely in families. He brings together families from across the globe, across cultures, across languages. I hesitate a little to share today’s story because I don’t want to make anyone feel guilty about what they might have said before. Please know that I’m not calling you out in any way if you have ever said this, but that I’m only trying to inspire some further thought on poverty and orphan care. One misconception a lot of people have is that impoverished children are incredibly happy. While it’s true that these children find joy apart from material possessions and American comforts, I think labeling African orphans with a broad label of “they’re always happy” can be damaging to relief work. So I will be clear. Suffering children aren’t always happy. They’re malnourished; their stomachs ache from hunger and their bodies are physically weak. They have diarrhea from parasites caused by drinking unclean water. This makes them feel fatigued and nauseated. These children miss their parents—and that grief and trauma is very real. When you see a slum in a developing country, tragedy is there. Sorrow is there. Truly, I don’t want to make anyone feel silly for having said that poor children are happy. There are many reasons to say this. The children’s happiness is not tied to material comforts, unlike many American children’s. I have seen so much more graciousness and thankfulness for small things among orphans than I have among American kids—they know what it is to go without, so many are thankful and joyful when they do receive. There is joy that extends beyond the lack of nice toys or a soft bed. Also, when you visit a school full of children receiving help, they still do experience hardship and grief, but they are flourishing. For the first time they’re able to live as children, and this is a wonderful reason for the joy that you see. And finally, when you meet children who love Jesus, his joy is in them—and that shines brighter than everything. So there is joy among people who live in poverty. But there is also grief. Please remember that if an orphan is malnourished and ill and without a family, they’re not always happy. They experience unimaginable pain. This is why your support matters—because when you sponsor a child, you are easing those burdens. You are providing hope to a child that is hurting.